Two other photographers with whom I moderate a flickr group talked recently about the "rental" approach to owning photographic gear. "I have an attitude of "rental" to cameras... If you really want to try it, buy it then sell it again on Ebay." Regular readers here will know that this is very much the way that I approach equipment. The nature of Digital cameras with the sensor (or "digital film") in the camera and the constant evolution of the technology, means that camera models go out of production much quicker than they did in film days. In 1987 I bought a Pentax 645 Medium format film camera. I used this until 1996 when it was stolen in a burglary. I replaced it with another Pentax 645. This was exactly the same model that I had bought in 1987. I used it until 2001 when I sold it. It was still current, again with no changes from the original. Contrast this with digital. The Panasonic G1 was announced in September 2008. 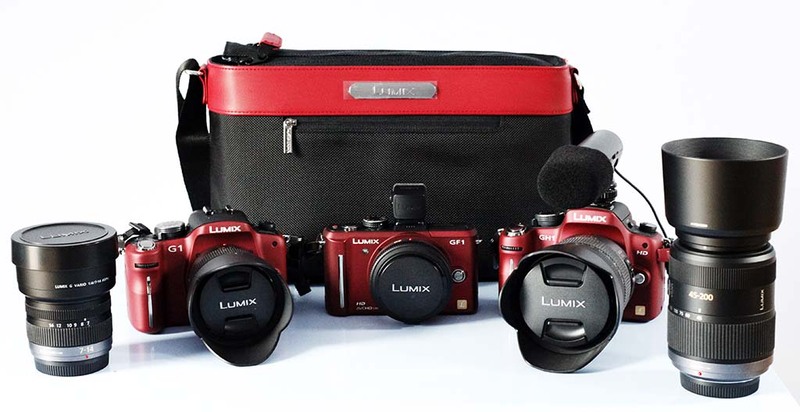 Panasonic have recently announced that they have ceased production of this camera. Since that initial announcement two new cameras, the GH1 and GF1 have been released and very shortly the G2 and G10 will be in the shops. All manufacturers work on a much shorter product cycle these days. Many of us chop and change our gear on a regular basis and are constantly in search of the "next big thing"
So is this a capitalist plot to subjugate us economically and keep us constantly salivating at the developments on the horizon? Or just a reflection of a constant ever evolving technological heaven? One, both or neither may be true but what is certain is that buying cameras these days doesn't have a sense of longevity about it. Back in October 2009 I was talking about the possibility of using m4/3 in "pro" situations http://soundimageplus.blogspot.com/2009/10/g-series-pro.html and I posted the picture at the top of this page. Of the kit in that picture I currently still own the GH1, 20mm F1.7 lens and the bag! Everything else has been sold on ebay. There's been no great changes in that time. The G1 is still a good camera. However I have bought a Samsung NX10 + lenses which to some extent has replaced parts of that outfit. I certainly prefer the results from that camera to those I obtained from the m4/3 kit in terms of stills. Things change, things move on. They always did, but at a much slower pace. The technology constantly improves, constantly evolves. Just recently, a firmware update for my M9 + a revised Lightroom software package has suddenly expanded the possibilities for that camera. The release of the Canon 550D with its incredible specification and low(er) price is making me question whether I should keep my 5D Mk II. Contrary to the popular myth that "Professionals" trash their cameras, nothing could be further from the truth. Aside from news and sports photographers who work under difficult and often very "camera unfriendly" conditions, most treat their equipment with care. It is obviously in their interests to do so. I'm no exception. I treat my cameras with great respect and they are in extremely good condition when I sell them. Consequently I can get good prices for them, which makes the "rental" approach much less financially draining than it would be if I was less careful. I like the Samsung as a light, small "long-distance" camera when I need autofocus, so that should take care of my needs and preferences for the time being. However there are two intriguing rumours currently circulating. As we are approaching April 1st. these are issued with a warning! One is that a famous photographer is testing an AF FF rangefinder system with a 35mm f1.2 lens. Another is that a Leica rep. has been saying that the company is working on an AF system for their next M Series model. Take these as improbable speculations and wish-list dreams. maybe this is more than a rumour!!! !